As predicted, the post-Mubarak period is presenting a series of both internal and international problems to the Egyptian bourgeoisie. The crisis which had already hit the Egyptian economy hard, has lately — following the events of Tahrir Square — become even worse. The Egyptian stock market has tumbled into the abyss. It took only a few sessions for the index to drop ten per cent, a fall that was only halted thanks to the automatic controls on the computers, otherwise the collapse would have been much worse. Over the last few months unemployment has reached the highest level yet while inflation is soaring. GDP has literally halved and the state coffers have emptied to the point that they are no longer able to pay civil servants. The process of pauperisation seems to have no end. In order to try and get the economy out of depression Morsi urgently needs at least $14.5 billion to pour into the empty state coffers. To obtain them, he is obliged to woo the principal financial and political institutions — from the European Union and the International Monetary Fund, to the governments of the old as well as those of the new alliance. As if this wasn’t enough, on 24 November Standard & Poor’s downgraded Egyptian state bonds to B+, precipitating panic within the new administration. Meanwhile, to cope with the dire economic situation, the Egyptian government was forced to turn to the strategic currency reserves of its central bank. In the single year of its administration these have fallen from $36 billion to $22 billion at present. At the same time, all the election promises of better living conditions, employment and support for the economy have vanished. It’s been calculated that the economic crisis post Mubarak has cost a wonderful €230million per day. 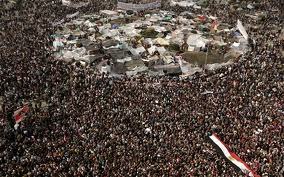 This is rock bottom: the squares are filled again and the future of Egyptian society is yet to be written. The Morsi Government and its Islamist inspired LJ (Liberty and Justice)party, along with its Salafist allies, have decided to turn this into a test of strength. Within a few months parliament has been dissolved, Tantawi, ex-head of the army and number two in the old regime, has been sacked, members of the judiciary have been locked up; with a sleight of hand the government has given itself exceptional powers and has organised a referendum on a new Sharia-based constitution. (As we write the referendum is still in progress, but the outcome should be a negative vote by the electorate in the big cities such as Cairo and Alexandria, while the Morsi project will probably be listened to in the smaller cities and countryside where the Muslim Brotherhood are more entrenched.) The opposition groups are active again, creating a collision situation within the "national system": between the Morsi government, the secular antagonists of Mohammed el Baradei and senior army executives, who in the old regime were the political and economic power, and who today still control 40% of Egypt’s GDP. However, the complex internal situation has to contend with the (re)structure of international imperialism. Profound economic weakness and political tensions are forcing the Morsi government into erratic, if not completely ambiguous, behaviour regarding the pressures being applied by the big centres of world imperialism who play their cards to the sound of promises and threats. The grassroots of the Islamic party of LJ, a subsidiary of the Muslim Brotherhood that was elected via plebiscite, demands a break with Israel, an anti-American stance, the redefinition of the Camp David Accords and unconditional support for Palestinian nationalism. If this happens, then bang goes the old axis of alliances between Egypt and the U.S. and Israel with all the consequences, in terms of political, economic, and financial aid. Thus Morsi is forced to move on many fronts, trying to juggle internal pressure points with the various international pressures. As for a hypothetical, gradual estrangement from the USA, even delayed over time, this would lead to the end of the US military umbrella, the abandonment of generous funding from Washington, the loss of this minimum of economic security particularly necessary at a time of deep crisis, and not least, the downsizing of the army, which has always been the support structure of domestic capitalism. Not for nothing Obama has explicitly made ​​known to Morsi, through the diplomatic mediation of Hilary Clinton, the US$ 480 million pledged to support the Egyptian economy by way of small and medium industries, and the almost $1.5 billion that has always been granted to the army, will reach the depleted state coffers only if things proceed as before, namely that the new government is kept within the previous political framework, i.e. the one from Camp David on. The alternative for the new ‘Pharaoh’ is to take it or leave it. This puts him in the position of softening the tone, of maintaining the ‘status quo’ and of not implementing the breach, at the same time as declaring his intention to build a semblance of autonomy in order to maintain the support of his electoral base. However, in the imperialist marketplace there are other matters which press closely on the new government. The EU, which did not hesitate to take its own opportunity, even if it is already established in the area, to promise funding of more than €4 billion to secure its own entry into the Egyptian corridors of power, a prerequisite for economic and financial deals that its most well-equipped members hope to conclude as soon as possible. Another actor hammering at Cairo’s door is China. It was no accident that on 29 August 2012 President Morsi chose to visit China along with 80 Egyptian entrepreneurs. It was his first official visit outside Arab countries with the declared aim of establishing new relations and improving the already existing ones with Beijing in order to get financial aid, investment and a secure and trustworthy political accord. Hu Jintao, Morsi’s opposite number obviously appreciated the Egyptian Government’s move, praising the need for the reinforcement of bilateral relations as the premise for an intense and lasting economic development. The exchange between the two countries (basically what China exports to Egypt) has flourished to reach tens of billions of dollars in the last year which is 50% greater than the year before. China has promised loans and investment in agriculture, tourism, telecommunications and scientific research. Furthermore Beijing has agreed to furnish Cairo with machine tools of various types and vehicles for the police. The China Development Bank has signed an agreement to loan $200 million to the Egyptian National Bank. The trip to China was followed by one to Iran for the meeting of the so-called Non-aligned Countries. It was another significant step towards new alliances even if it was not defined as such. It shows the attempt by Morsi to run with the hare and hunt with the hounds in order not to lose what he has already got in terms of international alliances without missing the chance to find new ones. It is the difficult balance between internal necessity and the complex arrangement of the world imperialist scene that both promises and threatens depending on old or new relations. The middle course is to steer between the demands of the electorate and the relations with Iran and Israel, between the threats of the USA and the allure of China. In addition there are the relations between the EU and the IMF, as well as between the pressures of Saudi Arabia and Qatar which have already poured $500 million into an exhausted Egypt. It is in the logic of capitalism that bourgeois manoeuvring, from the Islamist wing of Morsi with all its contortions, to the democratic demands of the secular opposition which puts itself forward as an alternative to the present government, represented by the Nasserist leader Hamdin Sabbahi, by Mohammed El Baradei and by Amr Mussa, are all within a national and nationalist framework. This oscillates between the ferocious reaction of the first and the “enlightened” conservatism of the second. In both cases an inevitable alignment with one or other imperialism is assumed, the only difference being determined by the economic and political priorities which the two line-ups want to pursue. In the middle stands the Army with its enormous weight which acts as a point of equilibrium both at home and abroad. Meanwhile it is in the logic of things, that in one way or another, all this could not go on without the stirrings of an opposition opposed to the schemes of all the bourgeois factions. This opposition is beginning to pose the issue in terms of the class struggle, and of anti-capitalism, resisting both the religious prison of Islamism and the deceit of the secularists. In these December days something has shifted. Repeated strikes have hit the economic areas linked to the trade route through the Suez Canal. On 7 December in the largest Egyptian textile factory in El Mahalla El Kubra a mass strike exploded which involved workers in seven other factories in the same sector. According to some accounts, substantial groups of hospital workers and students have turned up to offer support to the textile workers. They occupied the Mayor’s office and blocked road and rail routes in and out of the town. In addition they have set up a struggle committee outside of and against the official unions declaring that they want to distance themselves from the Egyptian state. In the political desert of the “Arab Spring” Egyptian style, these episodes are a demonstration of a revival of the class struggle in important sections of the Egyptian working class and have to be greeted with enthusiasm. First of all it is positive that significant fringes of the working class have had the courage to raise their heads and fight against the vexation of the new regime. It is also positive that the struggles started outside the unions, now identified as class collaborators, and not as defenders of class interests. It is also politically important that they have asked for and got solidarity from other parts of the working class. But this struggle also has to be criticised for its inevitable limits. It has to be stressed that the workers in Mahalla, after having overcome the obstacle of the institutionalised unions and taken the future of the struggle into their own hands, have then reorganised themselves within new unions, remaining within a demand (even if radical) perspective, on the terrain of economic reform and with a method of struggle to get it. Always assuming that the information going around is true, the strike has posed the question of the autonomous management of the factory without minimally posing the question of a struggle against this economic system. If it is true, then it is a symptom of serious political backwardness to declare some sort of secession from the Egyptian state. Even if every crisis does not propel the proletarian masses to struggle they will not move if they don’t have the wind of the crisis at their backs. That when struggles do begin they inevitably organise themselves on a demand-based and economistic terrain even when distancing themselves from the unions which are now in collusion with the economic system and have accepted its general framework and its need for survival. That inevitably whatever the revival of class struggle, even the hardest and most determined ends up defeated by repression or re-absorption within the system if it remains without a political perspective. Today in Egypt, or whatever other Arab country, tomorrow in Europe or in whatever country around the world, if an anti-capitalist vision, a revolutionary strategy and tactic, is missing from the struggle, if, that is’ a political instrument of the class is missing, even the most widespread proletarian revolt is destined to fail. The small but significant episode in Mahalla tells us this: it is the historic time for the revolutionary party so that future episodes of revival of the class struggle don’t remain on the terrain of demands, and of economic nationalism but become the small tesserae of a future mosaic of international revolution.